General Motors told Wall Street on Thursday that when it introduces the 2017 Chevrolet Bolt small electric car next year, it expects the cost of its battery cells to be an "industry-leading" $145 per kWh. GM goes on to state that they expect a lowering of the costs of EV battery cells to $100 per kilowatt-hour by 2022 which will allow EVs to compete with vehicles fuelled by petroleum. LG Chem CFO Cho Suk-jeh last year revealed the company will supply an automaker with a battery that will allow one of their models to travel more than 200 miles (320 km) on a single charge but declined to say which automaker. Although all indications point to LG Chem supplying the Bolt battery, GM do have other options. GM considered Envia a very strong candidate to provide a next generation battery for the Bolt, up until the firm flamed out in mid 2013. As for Sakti3, aside from a $15M investment from Sir James Dyson earlier this year, much less is known about their current Technology Readiness Level (TRL). 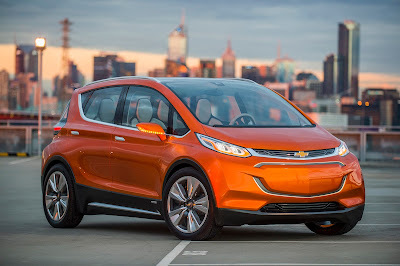 The automaker has produced 55 prototypes of the Bolt at plants in Seoul, South Korea, and Orion Township. They have been driven hard throughout GM's Milford Proving Grounds and early results are positive, engineers say. The Bolt is expected to go on sale in early 2017 and will have a range between charges of more than 320 km (200 miles). General Motors plan to begin building its new Chevrolet Bolt electric car in October 2016.